Acute lung injury is a serious phenomenon only recognized as having significant relevance to allogeneic blood transfusion in the last 15 years. It is not limited to transfusion events, and is also related to SIRS and sepsis. It is simulated in experimental models by lipoprotein, such as endotoxin. It occurs in the pretransfused surgical patient, or in the medical patient as well. Why it was not recognized earlier is a matter of conjecture. The significant reduction in immune modulated blood type incompatibility reactions in Western countries is a factor. The other factor is that the lipoprotein antigenic fractions involved are associated with component transfusions other than stored red cells. The following discussion will elaborate on what is increasingly recognized as a relevant issue in medicine today. In medicine, transfusion related acute lung injury (TRALI) is a serious blood transfusion complication characterized by the acute onset of non-cardiogenic pulmonary edema following transfusion of blood products. Although the incidence of TRALI has decreased with modified transfusion practices, it is still the leading cause of transfusion-related fatalities in the United States from fiscal year 2008 through fiscal year 2012. Micrograph of diffuse alveolar damage, the histologic correlate of TRALI. H&E stain. Very high magnification micrograph of hyaline membranes, as seen in diffuse alveolar damage (DAD), the histologic correlate of acute respiratory distress syndrome (ARDS), transfusion related acute lung injury (TRALI), acute interstitial pneumonia (AIP). TRALI is defined as an acute lung injury that is temporally related to a blood transfusion; specifically, it occurs within the first six hours following a transfusion. Occasionally more severe lung injury occurs as a result of this phenomenon and Acute Respiratory Distress Syndrome (ARDS) results. Leukocyte filters may prevent TRALI for those patients whose lung injury is due to leukoagglutination of the donor white blood cells, but because most TRALI is due to donor antibodies to leukocytes, filters are not helpful in TRALI prevention. Transfused plasma (from any component source) may also contain antibodies that cross-react with platelets in the recipient, producing usually mild forms of posttransfusion purpura or platelet aggregation after transfusion. Another nonspecific form of immunologic transfusion complication is mild to moderate immunosuppression consequent to transfusion. This effect of transfusion is not completely understood, but appears to be more common with cellular transfusion and may result in both desirable and undesirable effects. Mild immunosuppression may benefit organ transplant recipients and patients with autoimmune diseases; however, neonates and other already immunosuppressed hosts may be more vulnerable to infection, and cancer patients may possibly have worse outcomes postoperatively. Purpose: Transfusion-related acute lung injury (TRALI) is a devastating transfusion-associated adverse event. There is a paucity of data on the incidence and characteristics of TRALI cases that occur perioperatively. We classified suspected perioperative TRALI cases reported to Canadian Blood Services between 2001 and 2012, and compared them to non-perioperative cases to elucidate factors that may be associated with an increased risk of developing TRALI in the perioperative setting. Methods: All suspected TRALI cases reported to Canadian Blood Services (CBS) since 2001 were reviewed by two experts or, from 2006 to 2012, the CBS TRALI Medical Review Group (TMRG). These cases were classified based on the Canadian Consensus Conference (CCC) definitions and detailed in a database. Two additional reviewers further categorized them as occurring within 72 h from the onset of surgery (perioperative) or not in that period (non-perioperative). Various demographic and characteristic variables of each case were collected and compared between groups. Results: Between 2001 and 2012, a total of 469 suspected TRALI cases were reported to Canadian Blood Services; 303 were determined to be within the TRALI diagnosis spectrum. Of those, 112 (38%) were identified as occurring during the perioperative period. Patients who underwent cardiac surgery requiring cardiopulmonary bypass (25.0%), general surgery (18.0%) and orthopedics patients (12.5%) represented the three largest surgical groups. Perioperative TRALI cases comprised more men (53.6% vs. 41.4%, p = 0.04) than non-perioperative patients. Perioperative TRALI patients more often required supplemental O2 (14.3% vs. 3.1%, p = 0.0003), mechanical ventilation (18.8% vs. 3.1%), or were in the ICU (14.3% vs. 3.7%, p = 0.0043) prior to the onset of TRALI compared to non-perioperative TRALI patients. The surgical patients were transfused on average more components than non-perioperative patients (6.0 [SD = 8.3] vs. 3.6 [5.2] products per patient, p = 0.0002). Perioperative TRALI patients were transfused more plasma (152 vs. 105, p = 0.013) and cryoprecipitate (51 vs. 23, p < 0.01) than non-perioperative TRALI patients. There was no difference between donor antibody test results between the groups. Conclusion: CBS data has provided insight into the nature of TRALI cases that occur perioperatively; this group represents a large proportion of TRALI cases. Three decades ago, transfusion-related acute lung injury (TRALI) was considered a rare complication of transfusion medicine. Nowadays, the US Food and Drug Administration acknowledge the syndrome as the leading cause of transfusion-related mortality. Understanding of the pathogenesis of TRALI has resulted in the design of preventive strategies from a blood-bank perspective. A major breakthrough in efforts to reduce the incidence of TRALI has been to exclude female donors of products with high plasma volume, resulting in a decrease of roughly two-thirds in incidence. However, this strategy has not completely eradicated the complication. In the past few years, research has identified patient-related risk factors for the onset of TRALI, which have empowered physicians to take an individualized approach to patients who need transfusion. Development of an international consensus definition has aided TRALI research, yielding a higher incidence in specific patient populations than previously acknowledged Patients suffering from a clinical disorder such as sepsis are increasingly recognized as being at risk for development of TRALI. Thereby, from a diagnosis by exclusion, TRALI has become the leading cause of transfusion-related mortality. However, the syndrome is still under diagnosed and under-reported in some countries. Although blood transfusion can be life-saving, it can also be a life-threatening intervention. Physicians use blood transfusion on a daily basis. Increased awareness of the risks of this procedure is needed, because management of patient-tailored transfusion could reduce the risk of TRALI. Such an individualized approach is now possible as insight into TRALI risk factors evolves. Furthermore, proper reporting of TRALI could prevent recurrence. Absence of an international definition for TRALI previously contributed to underdiagnosis. As such, a consensus panel, and the US National Heart, Lung and Blood Institute Working Group in 2004, formulated a case definition of TRALI based on clinical and radiological parameters. The definition is derived from the widely used definition of acute lung injury (panel 1). Suspected TRALI is defined as fulfilment of the definition of acute lung injury within 6 h of transfusion in the absence of another risk factor (panel 1). Although this definition seems to be straightforward, the characteristics of TRALI are indistinguishable from acute lung injury due to other causes, such as sepsis or lung contusion. Therefore, this definition would rule out the possibility of diagnosing TRALI in a patient with an underlying risk factor for acute lung injury who has also received a transfusion. To identify such cases, the term possible TRALI was developed. Although the TRALI definition is an international consensus definition, surveillance systems in some countries, including the USA, France and the Netherlands, use an alternative in which imputability is scored. Imputability aims to identify the likelihood that transfusion is the causal factor. Imputability scores mostly imply that other causes of acute lung injury can be ruled out, so that diagnosis of TRALI is by exclusion. However, observational and animal studies suggest that risk factors for TRALI include other disorders, such as sepsis. Therefore, an imputability definition would result in underdiagnosis of TRALI. The consensus definition accommodates the uncertainty of the association of acute lung injury to the transfusion in possible TRALI. The conventional definition of TRALI uses a timeframe of 6 h in which acute lung injury needs to develop after a blood transfusion. In critically ill patients, transfusion increases the risk (odds ratio 2·13, 95% CI 1·75–2·52) for development of acute lung injury 6–72 h after transfusion. However, whether the pathogenesis of delayed TRALI is similar to that of TRALI is unclear. A two-hit hypothesis has been proposed for TRALI. The first hit is underlying patient factors, resulting in adherence of primed neutrophils to the pulmonary endothelium. The second hit is caused by mediators in the blood transfusion that activate the endothelial cells and pulmonary neutrophils, resulting in capillary leakage and subsequent pulmonary edema. The second hit can be antibody-mediated or non-antibody-mediated. Pathophysiology of two-hit mediated transfusion-related acute lung injury (TRALI). The pre-phase of the syndrome consists of a fi rst hit, which is mainly systemic. This first hit is the underlying disorder of the patient (eg, sepsis or pneumonia) causing neutrophil attraction to the capillary of the lung. Neutrophils are attracted to the lung by release of cytokines and chemokines from upregulated lung endothelium. Loose binding by L-selectin takes place. Firm adhesion is mediated by E-selectin and platelet-derived P-selectin and intracellular adhesion molecules (ICAM-1). In the acute phase of the syndrome, a second hit caused by mediators in the blood transfusion takes place. This hit results in activation of inflammation and coagulation in the pulmonary compartment. Neutrophils adhere to the injured capillary endothelium and marginate through the interstitium into the air space, which is filled with protein-rich edema fluid. In the air space, cytokines interleukin-1, -6, and -8, (IL-1, IL-6, and IL-8, respectively) are secreted, which act locally to stimulate chemotaxis and activate neutrophils resulting in formation of the elastase-α1-antitrypsin (EA) complex. Neutrophils can release oxidants, proteases, and other proinflammatory molecules, such as platelet-activating factor (PAF), and form neutrophil extracellular traps (NETs). Furthermore, activation of the coagulation system happens, shown by an increase in thrombin-antithrombin complexes (TATc), as does a decrease in activity of the fibrinolysis system, shown by a reduction in plasminogen activator activity. The influx of protein-rich edema fluid into the alveolus leads to the inactivation of surfactant, which contributes to the clinical picture of acute respiratory distress in the onset of TRALI. PAI-1 = plasminogen activator inhibitor-1. Antibody-mediated TRALI is caused by passive transfusion of HLA or human neutrophil antigen (HNA) and corresponding antibodies from the donor directed against antigens of the recipient. Neutrophil activation occurs directly by binding of the antibody to the neutrophil surface (HNA antibodies) or indirectly, mainly by binding to the endothelial cells with activation of the neutrophil (HLA class I antibodies) or to monocytes with subsequent activation of the neutrophil (HLA class II antibodies). The antibody titer and the volume of antibody containing plasma both increase the risk for onset of TRALI. Although the role of donor HLA and HNA antibodies from transfused blood is widely accepted, not all TRALI cases are antibody mediated. In many patients, antibodies cannot be detected. Furthermore, many blood products containing antibodies do not lead to TRALI. This finding has led to development of an alternative hypothesis for the onset of TRALI, termed non-antibody-mediated TRALI. Non-antibody-mediated TRALI is caused by accumulation of proinflammatory mediators during storage of blood products, and possibly by ageing of the erythrocytes and platelets themselves. Although most preclinical studies have noted a positive correlation between storage time of cell-containing blood products and TRALI, the mechanism is controversial. Two mechanisms have been suggested, including either plasma or the aged cells. In a small-case study and animal experiments, accumulation of bioactive lipids and soluble CD40 ligand (sCD40L) in the plasma layer of cell-containing blood products has been associated with TRALI. Bioactive lipids are thought to cause neutrophil activation through the G-protein coupled receptor on the neutrophil. The two-hit model suggests that patients in a poor clinical state are at risk for development of TRALI. However, cases have been described of antibody-mediated TRALI developing in fairly healthy recipients. To explain this discrepancy, a threshold model has been suggested in which a threshold must be overcome to induce a TRALI reaction. The threshold is dependent both on the predisposition of the patient (first hit) and the quantity of antibodies in the transfusion (second hit). A large quantity of antibody that matches the recipient’s antigen can cause severe TRALI in a recipient with no predisposition. Threshold model of antibody-mediated transfusion-related acute lung injury (TRALI). A specific threshold must be overcome to induce a TRALI reaction. To overcome a threshold, several factors act together: the activation status of the pulmonary neutrophils at the time of transfusion, the strength of the neutrophil-priming activity of transfused mediators (A), and the clinical status of the patient (B). The most effective prevention is a restrictive transfusion strategy. In a randomised clinical trial in critically ill patients, a restrictive transfusion policy for red blood cells was associated with a decrease in incidence of acute lung injury compared with a liberal strategy (7·7% vs 11·4%), suggesting that some of these patients might have had TRALI. The restrictive threshold was well tolerated and has greatly helped in guidance of red blood cell transfusion in the intensive-care unit. Transfusion cannot be avoided altogether. A multivariate analysis in patients in intensive care showed that patient related risk factors contributed more to the onset of TRALI than did transfusion-related risk factors, suggesting that development of a TRALI reaction is dependent more on host factors then on factors in the blood product. Therefore, a patient-tailored approach aimed at reducing TRALI risk factors could be effective to alleviate the risk of TRALI. Despite limitations of diagnostic tests, TRALI incidence seems to be high in at-risk patient populations. Therefore, TRALI is an underestimated health-care problem. Preventive measures, such as mainly male donor strategies, have been successful in reducing risk of TRALI. Identification of risk factors further improves the risk–benefit assessment of a blood transfusion. Efforts to further decrease the risk of TRALI needs increased awareness of this syndrome among physicians. Transfusion-related acute lung injury (TRALI) is the most serious complication of transfusion medicine. TRALI is defined as the onset of acute hypoxia within 6 hours of a blood transfusion in the absence of hydrostatic pulmonary edema. The past decades have resulted in a better understanding of the pathogenesis of this potentially life-threating syndrome. The present notion is that the onset of TRALI follows a threshold model in which both patient and transfusion factors are essential. The transfusion factors can be divided into immune and non-immune mediated TRALI. Immune-mediated TRALI is caused by the passive transfer of human neutrophil antibodies (HNA) or human leukocyte antibodies (HLA) present in the blood product reacting with a matching antigen in the recipient. Non-immune mediated TRALI is caused by the transfusion of stored cell-containing blood products. Although the mechanisms behind immune-mediated TRALI are reasonably well understood, this is not the case for non-immune mediated TRALI. The increased understanding of pathways involved in the onset of immune-mediated TRALI has led to the design of preventive strategies. Preventive strategies are aimed at reducing the risk to exposure of HLA and HNA to the recipient of the transfusion. These strategies include exclusion of “at risk” donors and pooling of high plasma volume products and have shown to reduce the TRALI incidence effectively. Studies show that, in at risk patient populations, up to 8% of transfused patients may develop TRALI. Since the syndrome TRALI has been recognized, evidence on the pathogenesis of TRALI has been accumulating. The present notion is that the onset of TRALI follows a threshold model in which both patient and transfusion factors are essential in the development of TRALI. The transfusion factors can be divided into immune and non-immune mediated TRALI. Immune-mediated TRALI is caused by the passive transfer of human neutrophil antibodies (HNA) or human leukocyte antibodies (HLA) present in the blood product, reacting with a matching antigen in the recipient. Non-immune mediated TRALI is caused by the transfusion of stored cell-containing blood products. In recent years, many countries have successfully implemented preventive strategies resulting in a decrease of the incidence of TRALI. Definition of transfusion-related acute lung injury (TRALI). The first landmark report creating the basis for the understanding of the pathogenesis of TRALI was published by Popovsky et al. in 1983. They provided evidence on the association between the presence of leucocyte antibodies in the donor serum and onset of acute lung injury in the recipient of the transfusion. It was also recognized that multiparous blood donors whose plasma contained these antibodies represented a potential transfusion hazard. It was this research group that was the first to identify TRALI as a distinct clinical entity. Subsequently, many other authors reported on the association between the presence of HLA or HNA antibodies in donor blood and the onset of TRALI in the recipient. Although the role of transfused blood donor HLA and HNA antibodies was widely accepted to be involved in the onset of TRALI, not all cases could be explained by this theory. A significant part of reported TRALI cases have no detectable antibodies. Also, many antibody-containing blood products fail to produce TRALI. The alternative hypothesis proposed by the group of Silliman posed that TRALI is a “two hit” event. The “first hit” is the underlying condition of the patient, resulting in priming of the pulmonary neutrophil. The “second hit” is the transfusion of a blood product causing activation of the neutrophils in the pulmonary compartment, causing pulmonary edema finally resulting in TRALI. The transfusion factors causing the “second hit” are divided in two groups; immune and non-immune mediated TRALI. The “second hit” is the transfusion itself and is either immune or non-immune mediated TRALI. The mechanisms behind immune-mediated TRALI are widely accepted and proven in both pre-clinical and clinical studies. The mechanisms involved in non-immune mediated TRALI are less clear. The role of stored cell-containing blood products in the onset of non-immune TRALI has extensively been studied in preclinical and clinical studies. Although most of the pre-clinical studies find a positive correlation between the transfusion of stored cell-containing blood products in the presence of a “first hit” and the onset of TRALI, the mechanism behind the onset is controversial. TRALI management consists mainly of preventing future adverse reactions and providing proper incidence estimates. All suspected TRALI cases should be reported to the blood bank for immunologic work-up as it is impossible to distinguish immune-mediated TRALI from non-immune mediated TRALI at bedside. Immunologic work-up includes testing of incompatibility by cross-matching donor plasma against recipient’s leucocytes. A donor with antibodies which are incompatible with the patient is excluded from further donation of blood for transfusion products. Furthermore, it is important to stress that the absence of a positive serologic work-up does not exclude the diagnosis of TRALI. TRALI is a clinical diagnosis and the immunologic work-up can be supportive but is not part of the diagnosis of TRALI. the two-event hypothesis and threshold hypothesis do not exclude the role of antibodies in the occurrence of TRALI in the presence of an inflammatory condition. Thus any patient fulfilling the TRALI definition (including possible TRALI) should be reported to the blood bank for an immunologic work-up of the recipient and the implicated donors on the presence of HLA and HNA antibodies. Prevention of immune-mediated TRALI is achieved by exclusion of donors proven to have HLA or HNA antibodies in their plasma present or donors “at risk” to have these antibodies present. neither HNA nor HLA antibodies are detectable in solvent/detergent fresh frozen plasma. Strategies to prevent the onset of TRALI include the exclusion of female plasma donors and the pooling of plasma products. These strategies have already been implemented in some countries resulting in a reduction of the incidence of TRALI. Allogeneic blood transfusion (ABT)-related immunomodulation (TRIM) encompasses the laboratory immune aberrations that occur after ABT and their established or purported clinical effects. TRIM is a real biologic phenomenon resulting in at least one established beneficial clinical effect in humans, but the existence of deleterious clinical TRIM effects has not yet been confirmed. Initially, TRIM encompassed effects attributable to ABT by immunomodulatory mechanisms (e.g., cancer recurrence, postoperative infection, or virus activation). More recently, TRIM has also included effects attributable to ABT by pro-inflammatory mechanisms (e.g., multiple-organ failure or mortality). TRIM effects may be mediated by: (1) allogeneic mononuclear cells; (2) white-blood-cell (WBC)-derived soluble mediators; and/or (3) soluble HLA peptides circulating in allogeneic plasma. This review categorizes the available randomized controlled trials based on the inference(s) that they permit about possible mediator(s) of TRIM, and examines the strength of the evidence available for relying on WBC reduction or autologous transfusion to prevent TRIM effects. Allogeneic blood transfusion (ABT) may either cause alloimmunization or induce tolerance in recipients. ABTs introduce a multitude of foreign antigens into the recipient, including HLA-DR antigens found on the donor’s dendritic antigen presenting cells (APCs). The presence or absence of recipient HLA-DR antigens on the donor’s white blood cells (WBCs) plays a decisive role as to whether alloimmunization or immune suppression will ensue following ABT. In general, allogeneic transfusions sharing at least one HLA-DR antigen with the recipient induce tolerance, while fully HLA-DR-mismatched transfusions lead to alloimmunization. In addition to the degree of HLA-DR compatibility between donor and recipient, the immunogenicity of cellular or soluble HLA antigens associated with transfused blood components depends on the viability of the donor dendritic APCs and the presence of co-stimulatory signals for the presentation of the donor antigens to the recipient’s T cells. Nonviable APCs and/or the absence of the requisite co-stimulatory signals result in T-cell unreponsiveness. Thus, when a multitude of antigens is introduced into the host by an ABT, the host response to some of these antigens is often decreased, and immune tolerance ensues. ABT has been shown to cause decreased helper T-cell count, decreased helper/suppressor T-lymphocyte ratio, decreased lymphocyte response to mitogens, decreased natural killer (NK) cell function, reduction in delayed-type hypersensitivity, defective antigen presentation, suppression of lymphocyte blastogenesis, decreased cytokine (IL-2, interferon-c) production, decreased monocyte/macrophage phagocytic function, and increased production of antiidiotypic and anticlonotypic antibodies. All these laboratory immune aberrations that indicate immune suppression and occur in transfused patients could potentially be associated with clinically-manifest ABT effects. Thus a variety of beneficial or deleterious clinical effects, potentially attributable to ABT-related immunosuppression, have been described over the last 30 years. The constellation of all such ABT-associated laboratory and clinical findings is known as ABT-related immunomodulation (TRIM). Initially, TRIM encompassed effects attributable to ABT by means of immunologic mechanisms only; however more recently, the term has been used more broadly, to encompass additional effects that could be related to ABT by means of ‘‘proinflammatory’’ rather than ‘‘immunomodulatory’’ mechanisms. Over 30 years ago, it was reported that pre-transplant ABTs could improve renal-allograft survival in patients who had undergone renal transplantation. This beneficial immunosuppressive effect of ABT has been confirmed by animal data, observational clinical studies, and clinical experience worldwide, although it has not been proven in randomized controlled trials (RCTs). Before the advent of the AIDS pandemic, it had become standard policy in many renal units to deliberately expose patients on transplant waiting lists to one or more red blood cell (RBC) transfusions. All the available data considered together indicate that TRIM is most likely a real biologic phenomenon, which results in at least one established beneficial clinical effect in humans, although the available evidence has not yet confirmed the existence and/or magnitude of the deleterious clinical TRIM effects. In fact, the debate over the existence of such deleterious clinical TRIM effects has been long and sometimes acrimonious. Many studies tended to indicate that patients receiving perioperative transfusion (compared with those not needing transfusion) almost always had a higher risk of developing postoperative bacterial infection. The studies also indicated that patients receiving ABT differed from those not receiving a transfusion in several prognostic factors that predisposed to adverse clinical outcomes. during storage; and/or (3) soluble HLA class I peptides that circulate in allogeneic plasma. If each of these mediators do cause TRIM effects, ABT effects mediated by allogeneic mononuclear cells would be expected to be preventable by WBC reduction (performed either before or after storage of cellular blood components), as well as by autologous transfusion. The ABT effects mediated by soluble HLA peptides circulating in allogeneic plasma would be expected to be preventable only by autologous transfusion. Conceptually, clonal deletion refers to the inactivation and removal of alloreactive lymphocytes that would, for example, cause the rejection of an allograft; anergy implies immunologic nonresponsiveness; and immune suppression suggests that the responding cell is being inhibited of doing so by a cellular mechanism or by a cytokine. Antiidiotypic antibodies, which are predominantly of the VH6 gene family, have also been demonstrated in the sera of ABT recipients and in patients with long-term functioning renal allografts. To date, no RCT has enrolled patients with sarcomas—tumors whose growth is stimulated by TGF-β—or patients with tumors for which the immune response plays a major role. (These would include skin tumors—such as melanomas, keratoacanthomas, squamous and basal-cell carcinomas—and certain virus-induced tumors—notably Kaposi’s sarcoma and certain lymphomas.) Instead, the 3 available RCTs of ABT and cancer recurrence enrolled patients with colorectal cancer—a tumor that is not sufficiently antigenic to render an impairment of host immunity capable of facilitating tumor growth, and a tumor whose cells have not been shown to be stimulated by TGF-β. Fig not shown. Randomized controlled trials (RCTs) investigating the association of WBC-containing allogeneic blood transfusion (ABT) with cancer recurrence. For each RCT, the figure shows the odds ratio (OR) of cancer recurrence in recipients of non-WBC-reduced allogeneic versus autologous or WBC-reduced allogeneic RBCs, as calculated from an intention-to-treat analysis. A deleterious effect of ABT (and thus a benefit from autologous transfusion or WBC reduction) exists when the OR is greater than 1 as well as statistically significant. (In the figure, each OR is surrounded by its 95% confidence interval [CI]; if the 95% CI of the OR includes the null value of 1, the TRIM effect is not statistically significant [p > 0.05]). Fig not shown. Randomized controlled trials (RCTs) investigating the association of WBC-containing allogeneic blood transfusions with postoperative infection (n = 17). For each RCT, the figure shows the odds ratio (OR) of postoperative infection in recipients of non-WBC reduced allogeneic versus autologous or WBC-reduced allogeneic RBCs, as calculated from an intention-to-treat analysis. A deleterious effect of ABT (and thus a benefit from autologous transfusion or WBC reduction) exists when the OR is greater than 1 as well as statistically significant. (In the figure, each OR is surrounded by its 95% confidence interval [CI]; if the 95% CI of the OR includes the null value of 1, the TRIM effect is not statistically significant [p > 0.05]). The totality of the evidence from RCTs does not demonstrate a TRIM effect manifest across all clinical settings and transfused RBC products. Instead, WBC-containing ABT is associated with an increased risk of short-term (up to 3-month post transfusion) mortality from all causes combined specifically in cardiac surgery. The additional deleterious TRIM effect detected by the latest meta-analysis (i.e., the effect on postoperative infection prevented by poststorage filtration) contradicts current theories about the pathogenesis of TRIM, because it is not accompanied by a similar or larger effect prevented by prestorage filtration. Thus, only in cardiac surgery (Fig. 5 – not shown) are the findings of RCTs pertaining to a deleterious TRIM effect consistent. Even in this setting, however, the reasons for the excess deaths attributed to WBC containing ABT remain elusive. The initial hypothesis suggested that WBC-containing ABT may predispose to MOF which, in turn, may predispose to mortality. However, hitherto, no cardiac-surgery RCT has demonstrated an association between WBC-containing ABT and MOF, and no other cause of death specifically attributed to WBC-containing ABT has been proposed. The TRIM effect seen in cardiac surgery deserves further study to pinpoint the cause(s) of the excess deaths, but-now that the majority of transfusions in Western Europe and North America are WBC reduced- the undertaking of further RCTs comparing recipients of non-WBC-reduced versus WBC reduced allogeneic RBCs in cardiac surgery is unlikely. For countries that have not yet converted to universal WBC reduction, whether to opt for WBC reduction of all cellular blood components transfused in cardiac surgery-in the absence of information on the specific cause(s) of death ascribed to WBC-containing ABT-is a policy decision that will have to be made based on the hitherto available data. Angiotensin II (Ang II) has been demonstrated as a pro-inflammatory effect in acute lung injury, but studies of the effect of Ang II on the formation of pulmonary edema and alveolar filling remains unclear. Therefore, in this study the regulation of alveolar fluid clearance (AFC) and the expression of epithelial sodium channel (ENaC) by exogenous Ang II was verified. SD rats were anesthetized and were given Ang II with increasing doses (1, 10 and 100 g/kg per min) via osmotic minipumps, whereas control rats received only saline vehicle. AT1 receptor antagonist ZD7155 (10 mg/kg) and inhibitor of cAMP degeneration rolipram (1 mg/kg) were injected intraperitoneally 30 min before administration of Ang II. The lungs were isolated for measurement of alveolar fluid clearance. The mRNA and protein expression of ENaC were detected by RT-PCR and Western blot. Exposure to higher doses of Ang II reduced AFC in a dose-dependent manner and resulted in a non-coordinate regulation of α-ENaC vs the regulation of β- and ϒ-ENaC, however Ang II type 1 (AT1) receptor antagonist ZD7155 prevented the Ang II-induced inhibition of fluid clearance and dysregulation of ENaC expression. In addition, exposure to inhibitor of cAMP degradation rolipram blunted the Ang II-induced inhibition of fluid clearance. These results indicate that through activation of AT1 receptor, exogenous Ang II promotes pulmonary edema and alveolar filling by inhibition of alveolar fluid clearance via downregulation of cAMP level and dysregulation of ENaC expression. Effects of angiotensin II (Ang II) receptor antagonists and rolipram on rat alveolar fluid clearance (AFC). Then AFC was measured 1 h after fluid instillation (4 mL/kg). Amiloride (100 M), Ang II (10−7 M), ZD7155 (10−6 M), and rolipram (10−5 M) were added to the instillate as indicated (n = 10 per group). Mean values ± SEM. p < 0.01 vs control. p < 0.01 vs Ang II + ZD7155. p < 0.05 vs amiloride. p < 0.05 vs Ang II. Effects of angiotensin II (Ang II) on cyclic adenosine monophosphate (cAMP) concentration in lung. Rats were given saline or Ang II (1, 10 and 100 µg/kg per min) for 6 h, and cAMP in lung was determined by RIA (n = 30 per group). Mean values ± SEM. p < 0.01 vs control. p < 0.05 vs 10 µg/kg Ang II. Histological examination of lung. Rats were given saline or Ang II (10 µg/kg per min) by osmotic minipump for 6 h. ZD7155 (10 mg/kg) was injected intraperitoneally 30 min before administration of Ang II. Shown are representative lung specimens obtained from the control (A), Ang II (B) and Ang II + ZD7155 (C) groups. All photographs are at 100× magnification. Interstitial edema and inflammatory cell infiltration were seen in Ang II group, but reduced in Ang II + ZD7155 group. (1) high doses of Ang II led to reduction of alveolar fluid clearance, and this effect was blunted by an AT1 receptor antagonist. (2) Ang II infusion increased the abundance of α-ENaC, whereas decreased the abundance ofβ and ϒ-ENaC, and these effects were reversed in response to an AT1 receptor antagonist. 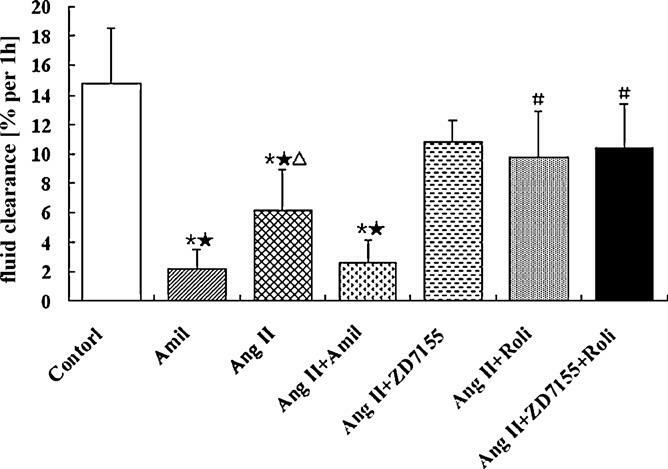 (3) Ang II infusion decreased cAMP concentration in lung tissue, and an inhibitor of cAMP degradation prevented inhibition of alveolar fluid clearance by Ang II, but had no effect on the dysregulation of ENaC. Our data indicate that Ang II results in pulmonary edema by inhibition of alveolar fluid clearance via down-regulation of cellular cAMP level and dysregulation of the abundance of ENaC, whereas these effects are prevented by an AT1 receptor antagonist. The renin-angiotensin system is a major regulator of body fluid and sodium balance, predominantly through the actions of its main effector Ang II. Several previous experimental studies demonstrated that plasma Ang II levels vary in both physiological and pathological conditions. In the kidney, Ang II added to the peritubular perfusion has a biphasic action with stimulation of sodium reabsorption at low doses (10−12–10−10M) and inhibition at high doses (10−7–10−6M) (Harris and Young, 1977). In vitro, Ang II also exerts a dose-dependent dual action on intestinal absorption (Levens, 1985). The evidence shows that the effect of Ang II on sodium and water absorption is dose-dependent. Our results showed that low intravenous doses of Ang II (<1 µg/kg per min) had no effect on alveolar fluid clearance which represents the sodium and water reabsorption in alveoli. However, with high intravenous doses, Ang II decreased alveolar fluid clearance. This finding suggests that the effect of Ang II on fluid absorption in lung is also dose-dependent. in the development of ALI after either hemorrhage or endotoxemia. Acute lung injury (ALI) is a disease marked by diffuse endothelial injury and increased capillary permeability. The coagulation system is a major participant in ALI and activation of coagulation is both a consequence and contributor to ongoing lung injury. Increased coagulation and depressed fibrinolysis result in diffuse alveolar fibrin deposition which serves to amplify pulmonary inflammation. In addition, existing evidence demonstrates a direct role for different components of coagulation on vascular endothelial barrier function. In particular, the pro-coagulant protein thrombin disrupts the endothelial actin cytoskeleton resulting in increased endothelial leak. In contrast, the anti-coagulant activated protein C (APC) confers a barrier protective actin configuration and enhances the vascular barrier in vitro and in vivo. However, recent studies suggest a complex landscape with receptor cross-talk, temporal heterogeneity and pro-coagulant/anticoagulant protein interactions. In this article, the major signaling pathways governing endothelial permeability in lung injury are reviewed with a particular focus on the role that endothelial proteins, such as thrombin and APC, which play on the vascular barrier function. Acute lung injury (ALI) is a devastating illness with an annual incidence of approximately 200,000 and a mortality of 40%. Most commonly seen in the setting of sepsis, ALI is a complex inflammatory syndrome marked by increased vascular permeability resulting in tissue edema and organ dysfunction. The vascular endothelium is a key target and critical participant in the pathogenesis of sepsis-induced organ dysfunction and disruption of the endothelial barrier is central to the pathophysiology of both sepsis and ALI. Sepsis and acute lung injury (ALI) are syndromes marked by diffuse inflammation with a key feature being endothelial cell barrier disruption and increased vascular permeability resulting in widespread organ dysfunction. The endothelial cytoskeleton has been identified as a critical regulator of vascular barrier integrity with a current model of endothelial barrier regulation suggesting a balance between barrier-disrupting cellular contractile forces and barrier-protective cell–cell and cell–matrix forces. These competing forces exert their opposing effects via manipulation of the actin-based endothelial cytoskeleton and associated endothelial regulatory proteins. Endothelial cells generate tension via an actomyosin motor, and focally distributed changes in tension/relaxation can be accomplished by spatially-defined regulation of the phosphorylation of the regulatory 20 kDa myosin light chain (MLC) catalyzed by the Ca2+/calmodulin (CaM)-dependent enzyme myosin light chain kinase (MLCK). Thrombin is the proto-typical coagulation protein with direct effects on the endothelial barrier via alterations in the cytoskeleton. In the coagulation cascade, thrombin converts fibrinogen to fibrin in the final step of thrombus formation and also activated platelets. In addition, this multifunctional protease is present at sites of vascular inflammation and induces barrier dysfunction. Through its receptor, protease-activated receptor-1 (PAR1), thrombin initiates a series of events which includes MLC phosphorylation, dramatic cytoskeletal reorganization and stress fiber formation, increased cellular contractility, paracellular gap formation, and enhanced fluid and protein transport. Similarly, thrombin exposure results in increased pulmonary edema in vivo, a finding which is also seen after treatment with a PAR1 activating peptide and attenuated in PAR1 knockout mice. Disruptions in the coagulation system have long been recognized to be an integral part of inflammation, sepsis and ALI. In 1969, Saldeen demonstrated that thrombin infusion produced canine respiratory insufficiency which was linked pathologically to emboli in the pulmonary microcirculation, a condition he labeled the “Microembolism Syndrome” (Saldeen, 1979). Elemental to the pathophysiology of sepsis and ALI is a shift towards a pro-coagulant state. Bronchoalveolar (BAL) fluid from patients with ALI reflects this increase in procoagulant activity with elevated levels of fibrinopeptide A, factor VII and d-dimer. Concomitantly, there is a decrease in fibrinolytic activity, as shown by depressed BAL levels of urokinase and increased levels of the fibrinolysis inhibitors plasminogen activator inhibitor (PAI) and α2-antiplasmin. Given that APC is a vascular endothelial protein which interacts with other coagulation proteins such as thrombin, it seems logical that it might have an effect on endothelial integrity. In cultured human pulmonary endothelial cells, while thrombin results in decreased electrical resistance, a reflection of increased permeability, pre- or post-exposure to physiologic concentrations of APC significantly attenuates this thrombin-induced drop in resistance. These APC-mediated alterations in barrier function are associated with MLC phosphorylation as well as activation of the endothelial protein Rac, and cytoskeletal re-arrangement in a barrier protective configuration all findings very reminiscent of the barrier protective signaling induced by the bioactive lipid, S1P. Interestingly, APC appears to activate sphingosine kinase and mediate its barrier protective effects through PI3 kinase and AKT-dependent ligation of the S1P receptor, S1P1. Moreover, the endothelial barrier-protective effects of APC have been observed in other tissues including brain and kidney. The barrier protection in these beds appears independent of any anti-coagulant effect of APC and is associated with decreased endothelial apoptosis. Recently, the endothelial protein C receptor (EPCR) has been identified as a crucial participant in the protein C pathway. Structurally similar to the major histocompatibility class I/CD1 family of molecules, EPCR binds protein C, presenting it to the thrombin/TM complex, thereby increasing the activation of protein C by ∼20 fold. Importantly, APC can also bind EPCR, and while the bound form of APC loses its extra-cellular anti-coagulant activity, increasing evidence indicates that much, if not all, of APC intra-cellular signaling requires EPCR. APC-mediated increases in endothelial phosphor-MLC and activated Rac are all EPCR-dependent and APC-induced endothelial barrier protection requires ligation of EPCR. Sepsis and ALI are significant causes of morbidity and mortality in the intensive care unit and are marked by zealous activation of the coagulation system. While this could conceivably confer certain benefits, such as enclosing and spatially controlling an infection, it is clear that this pro-coagulant environment participates in the pathophysiology of ALI, particularly via exacerbating endothelial damage and augmenting endothelial permeability. However, the biology of coagulation in ALI is incompletely understood and trials of new therapies specifically targeting coagulation in patients with ALI have been disappointing. Despite this, recent advances in the knowledge of the dynamic interplay between inflammation and coagulation in ALI as well as endothelial receptor-ligand binding and receptor cross talk have stimulated promising research and identified novel therapeutic targets for patients with ALI. Phosphatidylserine-expressing cell by-products in transfusion: A pro-inflammatory or an anti-inflammatory effect? Labile blood products contain phosphatidylserine-expressing cell dusts, including apoptotic cells and microparticles. These cell by-products are produced during blood product process or storage and derived from the cells of interest that exert a therapeutic effect (red blood cells or platelets). Alternatively, phosphatidylserine-expressing cell dusts may also derived from contaminating cells, such as leukocytes, or may be already present in plasma, such as platelet-derived microparticles. These cell by-products present in labile blood products can be responsible for transfusion induced immunomodulation leading to either transfusion-related acute lung injury (TRALI) or increased occurrence of post-transfusion infections or cancer relapse. In this review, we report data from the literature and our laboratory dealing with interactions between antigen-presenting cells and phosphatidylserine-expressing cell dusts, including apoptotic leukocytes and blood cell-derived microparticles. Then, we discuss how these phosphatidylserine-expressing cell by-products may influence transfusion. Potential consequences of phosphatidylserine-expressing cell by-products in transfusion. Interactions of phosphatidylserine-expressing cell dusts (apoptotic cells or microparticles) may lead to antigen-presenting cell activation or inhibition. Antigen-presenting cell activation may trigger inflammation and be involved in transfusion-related acute lung injury (TRALI), while antigen-presenting cell inhibition may exert transient immunosuppression or tolerance. Blood product process or storage may influence the generation of phosphatidylserine-expressing cell dusts. PtdSer: phosphatidylserine; APC: antigen-presenting cell. Several publications report the presence of phosphatidylserine-expressing cell by-products in blood products. These cell by-products may be generated during the blood product process, such as filtration, or during storage (either cold storage for red blood cells or between 20–24 ◦C for platelets). Alternatively, they may be limited by filtration. Phosphatidylserine-expressing cell by-products can be apoptotic cells. Apoptotic cells have been found in different blood products: red blood cell units and platelet concentrates. These apoptotic cells correspond to dying cells of interest: red blood cells or platelets, both enucleated cells that can undergo apoptosis. Immunomodulatory effects of apoptotic leukocytes. Early during the apoptotic program, phosphatidylserine-exposure occurs leading to apoptotic cell removal by macrophages or conventional dendritic cells. This uptake by antigen-presenting cells induces the production of anti-inflammatory factors and concomitantly inhibits the synthesis of inflammatory cytokines. These antigen-presenting cells are refractory to TLR activation. This leads to a transient immunosuppressive microenvironment. If antigen-presenting cells from this microenvironment migrate to secondary lymphoid organs, naive T cells are converted into inducible regulatory T cells. This leads to tolerance against apoptotic cell-derived antigens. M: macrophage; cDC: conventional dendritic cells; PtdSer: phosphatidylserine; Treg: regulatory T cells; Th1: helper T cells; HGF: hepatocyte growth factor; IL-: interleukin; NO: nitrite oxide; PGE-2: prostaglandin-E2; TGF: transforming growth factor; TNF: tumor necrosis factor; TLR: Toll-like receptor. Based on data from our group and Peter Henson’s group, some authors have speculated that apoptotic leukocytes present in blood products may be responsible for transfusion-related immunosuppression. 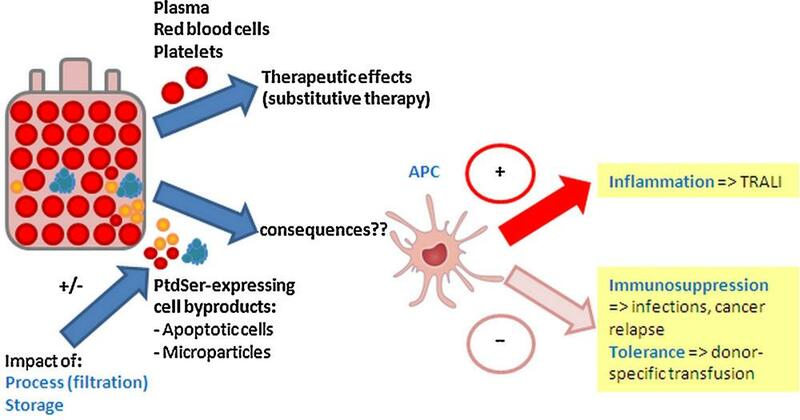 The first consequences of phosphatidylserine-expressing apoptotic cells in blood products may be a transient immunosuppression−responsible for an increase in infection rate and of cancer relapse−or tolerance induction− as observed after donor-specific transfusion − when Treg have been generated. However, apoptotic leukocytes become secondarily necrotic in the absence of phagocytes. This may certainly occur in blood product bags. Necrotic cells, through the release of damage-associated molecular patterns, may become immunogenic. The same process may occur for platelets. Necrotic platelets may represent the procoagulant form of platelets. Thus, hemostatic activation of platelets or their by-products may link thrombosis and inflammation to amplify lung microvascular damage during nonimmune TRALI. 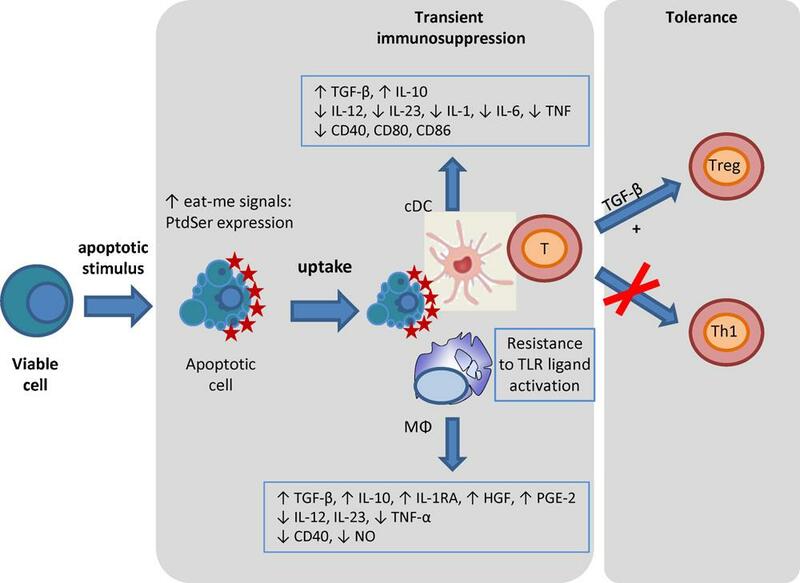 What are the next steps to answer the question on the role of phosphatidylserine-expressing cell dusts in the modulation of immune responses after transfusion? expression of the recently described phosphatidylserine receptors on different antigen-presenting cell subsets may also explain the different responses between plasmacytoid dendritic cells versus conventional dendritic cells/macrophages and may impact on the overall immune response. Peroxisome proliferator-activated receptors (PPARs) are members of the nuclear hormone receptors family. PPARs are a family of 3 ligand-activated transcription factors: PPARa (NR1C1), PPARh/y (NUC1; NR1C2), and PPARg (NR1C3). PPARα, -h/y, and -ϒ are encoded by different genes but show substantial amino acid similarity, especially within the DNA and ligand binding domains. All PPARs act as heterodimers with the 9-cis-retinoic acid receptors (retinoid X receptor; RXRs) and play important roles in the regulation of metabolic pathways, including those of lipid of biosynthesis and glucose metabolism, as well as in a variety of cell differentiation, proliferation, and apoptosis pathways. Recently, there has been a great deal of interest in the involvement of PPARs in inflammatory processes. PPAR ligands, in particular those of PPARα and PPARϒ, inhibit the activation of inflammatory gene expression and can negatively interfere with proinflammatory transcription factor signaling pathways in vascular and inflammatory cells. Furthermore, PPAR levels are differentially regulated in a variety of inflammatory disorders in man, where ligands appear to be promising new therapies. Fig. not shown. Structure and transcriptional activation of PPARs. (A) Generic schematic of the structure of the PPAR family of nuclear receptors. Indicated are the N–C terminal regions subdivided in to 4 domains: the A/B, N terminal domain [also called the activation function (AF)-1 domain]; C, the DNA binding domain; D, the F hinge_region; and E, the ligand binding domain (AF-2). (B) Generic scheme for the activation of a PPAR receptor as a transcription factor. PPAR activation leads to heterodimerization with RXR and an accumulation in the nucleus. Ligand activation of PPAR results in a change from a repressed binding protein complex which may contain histone deacetylases (HDAC), the nuclear receptor corepressor (NCo-R), and the silencing mediator of retinoid and thyroid signaling (SMRT) to an activation complex that may contain the histone acetylases, steroid receptor co-activator-1 (SRC-1), the PPAR binding protein (PBP), cAMP response element binding protein (CBP/p300), TATA box binding proteins, and RNA polymerase (RNA pol) III. The activated PPAR–RXR heterodimer complex binds to DNA sequences called PPAR response elements (PPRE) in target genes initiation their transcription. Although the nature of true endogenous PPAR ligands are still not known (Bishop-Bailey & Wray, 2003), PPARs can be activated by a wide variety of F endogenous or pharmacological ligands. PPARα activators include a variety of endogenously present fatty acids, LTB4 and hydroxyeicosatetraenoic acids (HETEs), and clinically used drugs, such as the fibrates, a class of first-line drugs in the treatment of dyslipidemia. Similarly, PPARg can be activated by a number of ligands, including docosahexaenoic acid, linoleic acid, the anti-diabetic glitazones, used as insulin sensitizers, and a number of lipids, including oxidized LDL, azoyle-PAF, and eicosanoids, such as 5,8,11,14-eicosatetraynoic acid and the prostanoids PGA1, PGA2, PGD2, and its dehydration products of the PGJ series of cyclopentanones (e.g., 15 deoxy-D12,14-PGJ2). Dyslipidemia and insulin-dependent diabetes are commonly found existing together as part of the metabolic X syndrome. Because PPARa and PPARg ligands independently are useful clinical drugs in the treatment of these respective disorders, synthetic dual PPARα/ϒ ligands have recently been developed and show a combined clinical efficacy. PPAR h/y activators include fatty acids and prostacyclin and synthetic compounds L-165,041, GW501516, compound F and L-783,483. Unlike PPARα or-ϒ, there are no PPAR h/y drugs in the clinic, although ligands are in phase II clinical trials for dyslipidemia (http://www.science.gsk.com/pipeline). Indeed, part of the challenge in determining the function of PPARh/y has been the identification and availability of new ligands with more potency and selectivity for use as pharmacological tools. Fig. not shown. Mechanisms of the anti-inflammatory effects of PPARα. PPARα ligands inhibit the activities of NF-nB, AP-1, and T-bet within cells. In sites of local inflammation, tissue and endothelial cell activity is inhibited, and expressions of adhesion molecules (ICAM-1 and VCAM-1), pro-inflammatory cytokines (IL-1, -6, -8, -12, and TNFα), vasoactive mediators (inducible cyclo-oxygenase, inducible nitric oxide synthase, and endothelin-1; COX-2, iNOS, and ET-1), and proteases (MMP-9) are decreased. The inflammatory responses in leukocytes are also diminished. Monocyte/macrophage activity is decreased, and lipid metabolizing pathways increased, T- and B-lymphocyte proliferation and differentiation are inhibited, and T-lymphocyte and eosinophil chemotaxis reduced. Bold italic text indicates positive regulation by the PPAR, all other text indicates a negative regulation. Fig. not shown. Mechanisms of the anti-inflammatory effects of PPAR h/y. PPAR h/y ligands inhibit the activities of NF-nB and release the suppressor BCL-6 from PPAR h/y. In sites of local inflammation, endothelial cell adhesion molecule (VCAM-1) and chemokine (MCP-1) are reduced. PPAR h/y and its endogenous ligand(s) are induced during the inflammatory response in keratinocytes, which then promotes cell survival (integrin-linked kinase—Akt pathway) and wound healing. The inflammatory responses in monocyte/ macrophages are modulated. In the absence of ligand, PPAR h/y sequesters BCL-6 and induces MCP-1, MCP-3, and IL-1h. When PPAR h/y ligand is given, BCL-6 is released and MCP-1, -3, and IL-1h levels are reduced. Bold italic text indicates positive regulation by the PPAR, all other text indicates a negative regulation. Fig. not shown. Mechanisms of the anti-inflammatory effects of PPARg. PPARg ligands can inhibit the activities of NF-nB, AP-1, STAT-1, N-FAT, Erg-1, Jun, and GATA-3 within cells. In sites of local inflammation, tissue and endothelial cell activity is inhibited, and expression of adhesion molecules (ICAM-1), proinflammatory cytokines (IL-8, -12, and TNFα), chemokines (MCP-1, MCP-3, IP-10, Mig, and I-TAC), vasoactive mediators (inducible nitric oxide synthase and endothelin-1; iNOS and ET-1), and proteases (MMP-9) are decreased. The inflammatory responses in leukocytes are also diminished. Monocyte/ macrophage activity is decreased, T- and B-lymphocyte proliferation and differentiation are inhibited, and T-lymphocyte and eosinophil chemotaxis reduced. Platelet activity is inhibited and dendritic cell production of IL-12, and expression of CCL3, CCL5, and CD80 is reduced, so pro-inflammatory TH1 lymphocytes maturation is inhibited. Bold italic text indicates positive regulation by the PPAR, all other text indicates a negative regulation. The PPARs are one of the most intensely studied members of the nuclear receptor gene family, and since their initial discovery just over decade ago, the PPARs have attracted an increasing amount of experimental and clinical research by investigators from different scientific areas. PPARs through their central roles in regulating energy homeostasis regulate physiological function in many cell types, tissues, and organ systems. Many disease states from carcinogenesis to inflammation have been linked to abnormalities in the function of PPAR-regulated transcription factors. PPARs are expressed or regulate pathophysiology of diverse human disorders including atherosclerosis, inflammation, obesity, diabetes, and the immune response. PPARs have beneficial effects in many inflammatory conditions, where they regulate cytokine production, adhesion molecule expression, fibrinolysis cell proliferation, apoptosis, and differentiation. Further studies and development of novel PPAR ligands and their selective modulators may lead to novel therapeutic agents in the many conditions associated with inflammatory processes. (3) a disruption of the epithelial and endothelial barriers, caused by increased apoptosis or necrosis. Since, apart from ventilation strategies, no standard treatment exists for permeability edema, the following chapters will review a selection of novel approaches aiming to improve these parameters in the capillary endothelium and the alveolar epithelium. Apoptosis is an essential physiological process for the selective elimination of cells. However, the dysregulation of apoptotic pathways is thought to play an important role in the pathogenesis of ALI. Both delayed neutrophil apoptosis and enhanced endothelial/epithelial cell apoptosis have been identified in ALI/ARDS. In the case of neutrophils, which contribute significantly to ALI/ ARDS, studies in both animals and ARDS patients suggest that apoptosis is inhibited during the early stages (<2 h) of inflammation. Peroxisome proliferator-activated receptors (PPARs) are ligand-activated transcription factors belonging to the nuclear hormone receptor superfamily, that includes receptors for steroid hormones, thyroid hormones, retinoic acid, and fat-soluble vitamins. Since their discovery in 1990, increasing data has been published on the role of PPARs in diverse processes, including lipid and glucose metabolism, diabetes and obesity, atherosclerosis, cellular proliferation and differentiation, neurological diseases, inflammation and immunity. PPARs have both gene-dependent and gene-independent effects. Gene-dependent functions involve the formation of heterodimers with the retinoid X-receptor. Activation by PPAR ligands results in the binding of the heterodimer to peroxisome proliferator response elements, located in the promoter regions of PPAR-regulated genes. Gene independent effects involve the direct binding of PPARs to transcription factors, such as NF-kB, which then alters their binding to DNA promoter elements. PPARs can also bind and sequester various cofactors for transcription factors, and thus further alter gene expression. Importantly, the precise effects of PPARs vary greatly between cell types. To date, three subtypes of PPAR have been identified: α, β, and ϒ. There is increasing data suggesting that PPAR signaling may play an important role in the pathobiology of systemic vascular disease. However, there is less data implicating PPAR signaling in diseases of the lung. A role for PPARs in the control of inflammation was first evidenced for PPARα, where mice deficient in PPARα exhibited an increased duration of ear-swelling in response to the proinflammatory mediator, LTB4. More recently, a number of studies in mice and in humans have shown that PPAR agonists exhibit anti-inflammatory effects under a wide range of conditions. There are two main mechanisms by which PPARs exert their anti-inflammatory effect. The first involves complex formation, and the inhibition of transcription factors that positively regulate the transcription of pro-inflammatory genes. These include nuclear factor-kB (NF-kB), signal transducers and activators of transcription (STATs), nuclear factor of activated T cells (NF-AT), CAAT/enhancer binding protein (C/EBP) and activator protein 1 (AP-1). These transcription factors are the main mediators of the major proinflammatory cytokines, chemokines, and adhesion molecules involved in inflammation. The second PPAR-mediated anti-inflammatory pathway is mediated by the sequestration of rate limiting, but essential, co-activators or co-repressors. Recent studies have shown that PPAR signaling can attenuate the airway inflammation induced by LPS in the mouse. It was shown that mice treated with the PPARα agonist, fenofibrate, had decreases in both inflammatory cell infiltration and inflammatory mediators. Conversely, PPARα -/- mice have been shown to have a greater number of neutrophils and macrophages, and increased levels of inflammatory mediators in bronchoalveolar lavage fluids (BALF). Other PPAR agonists, such as rosiglitazone or SB 21994 have also been shown to reduce LPS-mediated ALI in the mouse lung. PPARϒ signaling has also been shown to be protective in regulating pulmonary inflammation associated with fluorescein isothiocyanate (FITC)-induced lung injury, with the PPARϒ ligand pioglitazone decreasing neutrophil infiltration. Collectively, these data suggest that therapeutic agents that activate either or both PPARα and PPARϒ could be beneficial for the treatment of ALI. Permeability edema is characterized by a reduced alveolar liquid clearance capacity, combined with an endothelial hyperpermeability. Various signaling pathways, such as those involving reactive oxygen species (ROS), Rho GTPases and tyrosine phosphorylation of junctional proteins, converge to regulate junctional permeability, either by affecting the stability of junctional proteins or by modulating their interactions. The regulation of junctional permeability is mainly mediated by dynamic interactions between the proteins of the adherens junctions and the actin cytoskeleton. Actin-mediated endothelial cell contraction is the result of myosin light chain (MLC) phosphorylation by MLC kinase (MLCK) in a Ca2+/calmodulin-dependent manner. RhoA additionally potentiates MLC phosphorylation, by inhibiting MLC phosphatase activity through its downstream effector Rho kinase (ROCK). As such, actin/myosin-driven contraction will generate a contractile force that pulls VE-cadherin inward. This contraction will force VE-cadherin to dissociate from its adjacent partner, as such producing interendothelial gaps. Vascular endothelial cells can be regulated by nucleotides released from platelets. During vascular injury, broken cells are also the source of the extracellular nucleotides. Furthermore, endothelium may provide a local source of ATP within vascular beds. Primary cultures of human endothelial cells derived from multiple blood vessels release ATP constitutively and exclusively across the apical membrane under basal conditions. Hypotonic challenge or the calcium agonists (ionomycin and thapsigargin) stimulate ATP release in a reversible and regulated manner. Enhanced release of pharmacologically relevant amounts of ATP was observed in endothelial cells under such stimuli as shear stress, lipopolysaccharide (LPS), and ATP itself. Pearson and Gordon demonstrated that incubation of aortic endothelial and smooth muscle cells with thrombin resulted in the specific release of ATP, which was converted to ADP by vascular hydrolases. Yang et al. showed that endothelial cells isolated from guinea pig heart release nucleotides in response to bradykinin, acetylcholine, serotonin and ADP. Nucleotide action is mediated by cell surface purinoreceptors. Once released from endothelial cells, ATP may act in the blood vessel lumen at P2 receptors on nearby endothelium downstream from the site of release. ATP is also degraded rapidly and its metabolites have also been recognized as signaling molecules, which can initiate additional receptor-mediated functions. These include ADP and the final hydrolysis product adenosine. 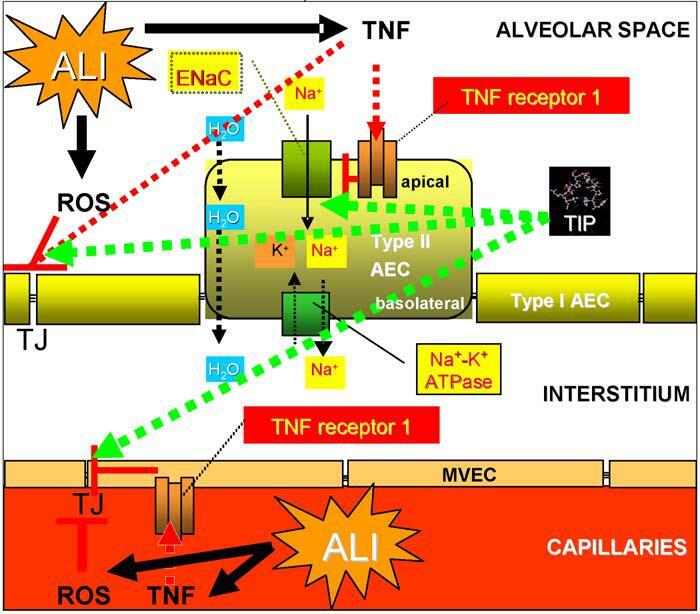 During the course of ALI, the alveolar space, as well as the interstitium, are sites of intense inflammation, leading to the local production of pro-inflammatory cytokines, such as IL-1β, TGF-β and TNF. The latter pleiotropic cytokine is a 51 kDa homotrimeric protein, binding to two types of receptors, i.e. TNF-R1 and TNF-R2 and which is mainly produced by activated macrophages and T cells. Soluble TNF, as well as the soluble TNF receptors 1 and 2, are generated upon cleavage of membrane TNF or of the membrane associated receptors, respectively, by the enzyme TNF-α convertase (TACE). TNF-R1, but not TNF-R2, contains a death domain, which signals apoptosis upon the formation of the Death Inducing Signaling Complex (DISC). In spite of its lack of a death domain, TNF-R2 can nevertheless be implicated in apoptosis induction, since its activation causes degradation of TNF Receptor Associated Factor 2 (TRAF2), an inhibitor of the TNF-R1-induced DISC formation. Moreover, apoptosis induction of lung microvascular endothelial cells by TNF was shown to require activation of both TNF receptors. TNF-R2 was also shown to be important for ICAM-1 upregulation in endothelial cells in vitro and in vivo, an activity important in the sequestration of leukocytes in the microvessels. Moreover, lung microvascular endothelial cells isolated from ARDS patients express significantly higher levels of TNF-R2 and of ICAM-1 than cells isolated from patients who had undergone a lobectomy for lung carcinoma, used as controls. These findings therefore suggest that ICAM-1 and TNF-R2 may have a particular involvement in the pathogenesis of acute lung injury. Dichotomous activity of TNF in alveolar liquid clearance and barrier protection during ALI. TNF, which is induced during ALI, causes a downregulation of ENaC expression in type II alveolar epithelial cells, upon activating TNF-R1. Moreover, TNF increases permeability, by means of interfering with tight junctions (TJ) in both alveolar epithelial (AEC) and capillary endothelial cells (MVEC). ROS, the generation of which is frequently increased during ALI, were also shown to downregulate ENaC and Na+-K+-ATPase expression and moreover also lead to decreased endothelial barrier integrity. The TIP peptide, mimicking the lectin-like domain of TNF, is able to increase sodium uptake in alveolar epithelial cells and to restore endothelial barrier integrity, as such providing a significant protection against the development of permeability edema (red lines: inhibition, green arrows: activation). 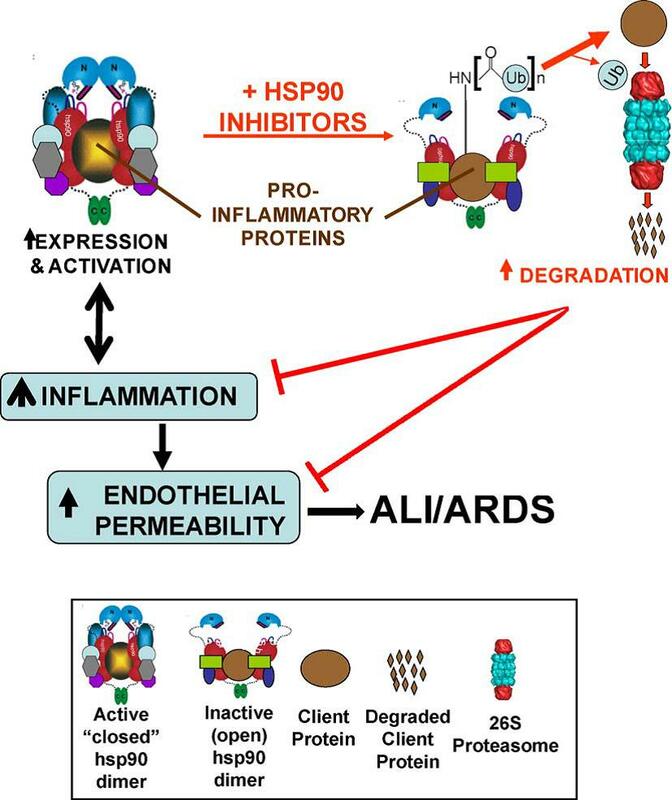 Proposed mechanism of action for the anti-inflammatory and barrier-protective actions of hsp90 inhibitors. Permeability edema represents a life-threatening complication of acute lung injury, severe pneumonia and ARDS, characterized by a combined dysregulation of pulmonary epithelial and endothelial apoptosis, endothelial barrier integrity and alveolar liquid clearance capacity. As such, it is likely that several of these parameters have to be targeted in order to obtain a successful therapy. This review focuses on a selection of recently discovered substances and mechanisms that might improve ALI therapy. As such, we have discussed the inhibition of apoptosis and necrosis occurring during ALI, by means of the restoration of Zn2+ homeostasis. PPARα and ϒ agonists can represent therapeutically promising molecules, since they inhibit transcription factors as well as essential co-activators involved in the activation of pro-inflammatory cytokines, chemokines and adhesion molecules, all of which are implicated in ALI. Apart from inducing a potent inhibition of inflammation upon interfering with NF-kB activation, hsp90 inhibitors were shown to prevent and restore endothelial barrier integrity. These agents are able to significantly improve survival and lung function during LPS-induced ALI. A restoration of endothelial barrier integrity during ALI can also be obtained upon increasing extracellular levels of ATP or adenosine, which activate the purinoreceptors P2Y and P1A2, respectively, leading to a decrease in myosin light chain phosphorylation and an increase in MLC phosphatase 1 activity. The pro-inflammatory cytokine TNF is involved in endothelial apoptosis and hyperpermeability, as well as in the reduction of alveolar liquid clearance, upon activating its receptors. However, apart from its receptor binding sites, TNF harbors a lectin-like domain, which can be mimicked by the TIP peptide. This peptide has been shown to increase alveolar liquid clearance and moreover induces endothelial barrier protection. As such, TNF can be considered as a moonlighting cytokine, combining both positive and negative activities for permeability edema generation within one molecule. Tong Chen, Yi Moua, Jiani Tan, LinlinWei, Yixue Qiao, Tingting Wei, et al. ALI is a clinical syndrome characterized by a disruption of epithelial integrity, neutrophil accumulation, noncardiogenic pulmonary edema, severe hypoxemia and an intense pulmonary inflammatory response with a wide array of increasing severity of lung parenchymal injury. Previous studies have shown that lots of pathogenesis contribute to ALI, such as oxidant/antioxidant dysfunction, dysregulation of inflammatory/anti-inflammatory pathway, upregulation of chemokine production and adhesion molecules. However, to date there is no effective medicine to control ALI. Lipopolysaccharide (LPS) is a main component of the outer membrane of Gram negative bacteria. It has been reported to activate toll like receptors 4 (TLR4) and to stimulate the release of inflammatory mediators inducing ALI-like symptoms. Intratracheal administration of LPS has been used to construct animal models of ALI. The biological importance of naturally occurring triterpenoids has long been recognized. Oleanolic acid, exhibiting modest biological activities, has been marketed in China as an oral drug for the treatment of liver disorders in humans. Among its derivatives, bardoxolonemethyl (2-cyano-3,12-dioxooleana-1,9(11)-dien-28-oic acid methylester) CDDO-Me, had completed a successful phase I clinical trial for the treatment of cancer and started a phase II trial for the treatment of patients with pulmonary arterial hypertension. For its broad spectrum antiproliferative and anti-tumorigenic activities, CDDO-Me has also been reported to possess a number of pharmacological activities such as antioxidant, anti-tumor and anti-inflammatory effects. However, the mechanisms by which CDDO-Me exerted its anti-inflammatory effects on macrophage were insufficiently elucidated. More importantly, there is no available report to evaluate its therapeutic effect on acute lung injury. CDDO-Me, initiated in a phase II clinical trial, is a potential useful therapeutic agent for cancer and inflammatory dysfunctions, whereas the therapeutic efficacy of CDDO-Me on LPS-induced acute lung injury (ALI) has not been reported as yet. The purpose of the present study was to explore the protective effect of CDDO-Me on LPS-induced ALI in mice and to investigate its possible mechanism. BalB/c mice received CDDO-Me (0.5 mg/kg, 2 mg/kg) or dexamethasone (5 mg/kg) intraperitoneally 1 h before LPS stimulation and were sacrificed 6 h later. W/D ratio, lung MPO activity, number of total cells and neutrophils, pulmonary histopathology, IL-6, IL-1β, and TNF-α in the BALF were assessed. Furthermore, we estimated iNOS, IL-6, IL-1β, and TNF-α mRNA expression and NO production as well as the activation of the three main MAPKs, AkT, IκB-α and p65. Pretreatment with CDDO-Me significantly ameliorated W/D ratio, lung MPO activity, inflammatory cell infiltration, and inflammatory cytokine production in BALF from the in vivo study. Additionally, CDDO-Me had beneficial effects on the intervention for pathogenesis process at molecular, protein and transcriptional levels in vitro. These analytical results provided evidence that CDDO-Me could be a potential therapeutic candidate for treating LPS-induced ALI. Effects of CDDO-Me on LPS-mediated lung histopathologic changes in lung tissues. (A) The lung section from the control mice; (B) the lung section from the mice administered with LPS (8 mg/kg); (C) the lung section from the mice administered with dexamethasone (5 mg/kg) and LPS (8 mg/kg); (D) the lung section from the mice administered with CDDO-Me (0.5mg/kg) and LPS (8mg/kg); (E) the lung section from the mice administered with CDDO-Me (2mg/kg) and LPS (8mg/kg); (hematoxylin and eosin staining, magnification 200×). Control group: the green arrow indicated alveolar wall, no hyperemia. All the other groups: The black arrow indicated the inflammatory cell infiltration; the green arrow indicated alveolar wall hyperemia. Brian M. Fuller, Nicholas M. Mohr, Thomas J. Graetz, et al. Purpose: Acute respiratory distress syndrome (ARDS) is associated with significant mortality and morbidity in survivors. Treatment is only supportive, therefore elucidating modifiable factors that could prevent ARDS could have a profound impact on outcome. The impact that sepsis-associated cardiac dysfunction has on ARDS is not known. Materials and Methods: In this retrospective observational cohort study of mechanically ventilated patients with severe sepsis and septic shock, 122 patients were assessed for the impact of sepsis-associated cardiac dysfunction on incidence of ARDS (primary outcome) and mortality. Results: Sepsis-associated cardiac dysfunction occurred in 44 patients (36.1%). There was no association of sepsis-associated cardiac dysfunction with ARDS incidence (p= 0.59) or mortality, and no association with outcomes in patients that did progress to ARDS after admission. Multivariable logistic regression demonstrated that higher BMI was associated with progression to ARDS (adjusted OR 11.84, 95% CI 1.24 to 113.0, p= 0.02). Conclusions: Cardiac dysfunction in mechanically ventilated patients with sepsis did not impact ARDS incidence, clinical outcome in ARDS patients, or mortality. This contrasts against previous investigations demonstrating an influence of nonpulmonary organ dysfunction on outcome in ARDS. Given the frequency of ARDS as a sequela of sepsis, the impact of cardiac dysfunction on outcome should be further studied. Ruhui Yang, Lina Yang, Xiangchun Shen, Wenyuan Cheng, et al. Crocetin, a carotenoid compound, has been shown to reduce expression of inflammation and inhibit the production of reactive oxygen species. In the present study, the effect of crocetin on acute lung injury induced by lipopolysaccharide (LPS) was investigated in vivo. In the mouse model, pretreatment with crocetin at dosages of 50 and 100 mg/kg reduced the LPS-induced lung edema and histological changes, increased LPS-impaired superoxide dismutase (SOD) activity, and decreased lung myeloperoxidase (MPO) activity. Furthermore, treatment with crocetin significantly attenuated LPS-induced mRNA and the protein expressions of interleukin-6 (IL-6), macrophage chemoattractant protein-1 (MCP-1), and tumour necrosis factor-α (TNF-α) in lung tissue. In addition, crocetin at different dosages reduced phospho-IκB expression and NF-κB activity in LPS-induced lung tissue alteration. 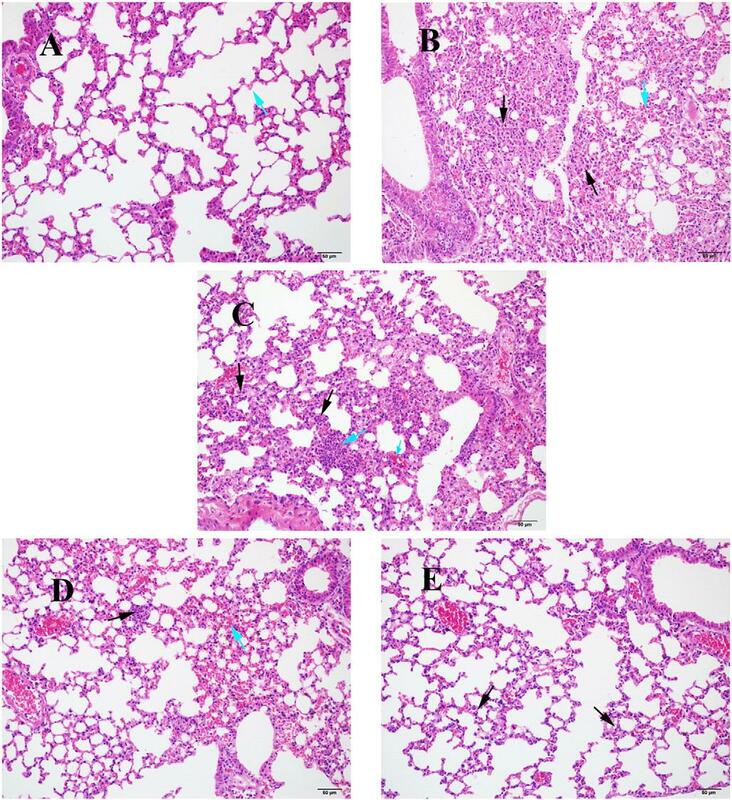 These results indicate that crocetin can provide protection against LPS-induced acute lung injury in mice. Hui-Jing Han, Mei Li, Jong-Keun Son, Chang-Seob Seo, et al. Previous studies have shown that sauchinone modulates the expression of inflammatory mediators through mitogen-activated protein kinase (MAPK) pathways in various cell types. However, little information exists about the effect of sauchinone on neutrophils, which play a crucial role in inflammatory process such as acute lung injury (ALI). We found that sauchinone decreased the phosphorylation of p38 MAPK in lipopolysaccharide (LPS)-stimulated murine bone marrow neutrophils, but not ERK1/2 and JNK. Exposure of LPS-stimulated neutrophils to sauchinone or SB203580, a p38 inhibitor, diminished production of tumor necrosis factor (TNF)-α and macrophage inflammatory protein (MIP)-2 compared to neutrophils cultured with LPS. Treatment with sauchinone decreased the level of phosphorylated ribosomal protein S6 (rpS6) in LPS-stimulated neutrophils. Systemic administration of sauchinone to mice led to reduced levels of phosphorylation of p38 and rpS6 in mice lungs given LPS, decreased TNF-α and MIP-2 production in bronchoalveolar lavage fluid, and also diminished the severity of LPS-induced lung injury, as determined by reduced neutrophil accumulation in the lungs, wet/dry weight ratio, and histological analysis. These results suggest that sauchinone diminishes LPS-induced neutrophil activation and ALI. In the present study, the systemic administration of sauchinone decreased the phosphorylation of p38 MAPK and rpS6 in mice lungs subjected to LPS and diminished the severity of LPS-induced ALI. Neutrophils play an important role in acute inflammatory processes, such as ALI, which was demonstrated by various experimental models. Previous reports suggested that p38 MAPK inhibition of murine neutrophils could lead to the loss of chemotaxis toward MIP-2, as well as the loss of TNF-αandMIP-2 production in response to LPS, and also attenuated neutrophil accumulation in LPS-induced ALI models. Therefore, the beneficial effects of sauchinone on LPS-induced ALI are likely associated with decreases in the production of pro-inflammatory mediators by neutrophils, consistent with our in vitro experiments. However, we cannot exclude that the effects of sauchinone on reducing the release of TNF-α and MIP-2 in mice lungs subjected to LPS, with the resultant prevention of ALI, could be affected by various pulmonary cell populations, such as alveolar macrophages. Also, the inhibitory effects of sauchinone on NF-κB activation through various pulmonary cell populations (Supplemental Fig. S2), in addition to p38MAPK activity in mouse lungs given LPS, might enhance the anti-inflammatory action of sauchinone in mouse lungs subjected to LPS. In conclusion, we found that sauchinone significantly diminished the release of inflammatory mediators in isolated neutrophils and lungs subjected to LPS. The anti-inflammatory action of sauchinone was associated with the prevention of p38 MAPK and rpS6 activation. These findings suggest that sauchinone may be an appropriate pharmacological candidate for the treatment of ALI as well as other neutrophil driven acute inflammatory diseases. Volkan Hancı, Gamze Yurdakan, Serhan Yurtlu, et al. Background: We assessed the effects of dexmedetomidine in a rat model of a-naphthylthiourea (ANTU)einduced acute lung injury. Methods: Forty Wistar Albino male rats weighing 200e240 g were divided into 5 groups (n = 8 each), including a control group. Thus, there were one ANTU group and three dexmedetomidine groups (10-, 50-, and 100-mg/kg treatment groups), plus a control group. The control group provided the normal base values. The rats in the ANTU group were given 10 mg/kg of ANTU intraperitoneally and the three treatment groups received 10, 50, or 100 mg/kg of dexmedetomidine intraperitoneally 30 min before ANTU application. The rat body weight (BW), pleural effusion (PE), and lung weight (LW) of each group were measured 4 h after ANTU administration. The histopathologic changes were evaluated using hematoxylin-eosin staining. Results: The mean PE, LW, LW/BW, and PE/BW measurements in the ANTU group were significantly greater than in the control groups and all dexmedeto-midine treatment groups (P < 0.05). There were also significant decreases in the mean PE, LW, LW/BW and PE/BW values in the dexmedetomidine 50-mg/kg group compared with those in the ANTU group (P < 0.01). The inflammation, hemorrhage, and edema scores in the ANTU group were significantly greater than those in the control or dexmedetomidine 50-mg/kg group (P < 0.01). Conclusion: Dexmedetomidine treatment has demonstrated a potential benefit by preventing ANTU-induced acute lung injury in an experimental rat model. Dexmedetomidine could have a potential protective effect on acute lung injury in intensive care patients. Xiaofeng Niu, YuWang, Weifeng Li, Qingli Mu, et al. Acute lung injury (ALI) is a life-threatening disease characterized by serious lung inflammation and increased capillary permeability, which presents a high mortality worldwide. Isofraxidin (IF), a Coumarin compound isolated from the natural medicinal plants such as Sarcandra glabra and Acanthopanax senticosus, has been reported to have definite anti-bacterial, anti-oxidant, and anti-inflammatory activities. However, the effects of IF against lipopoly-saccharide-induced ALI have not been clarified. The aim of the present study is to explore the protective effects and potential mechanism of IF against LPS-induced ALI in mice. In this study, We found that pretreatment with IF significantly lowered LPS-induced mortality and lung wet-to-dry weight (W/D) ratio and reduced the levels of tumor necrosis factor-α (TNF-α), interleukin-6 (IL-6), and prostaglandin E2 (PGE2) in serum and bronchoalveolar lavage fluid (BALF). We also found that total cells, neutrophils and macrophages in BALF,MPO activity in lung tissues were markedly decreased. Besides, IF obviously inhibited lung histopathological changes and cyclooxygenase-2 (COX-2) protein expression. These results suggest that IF has a protective effect against LPS induced ALI, and the protective effect of IF seems to result from the inhibition of COX-2 protein expression in the lung, which regulates the production of PGE2. Ingestion of LPS stimulates vascular permeability, promotes inflammatory cytokines such as tumor necrosis factor-α (TNF-α) and interleukin-6 (IL-6) from blood into lung tissues and activates numerous inflammatory cells such as neutrophils and macrophages. In macrophages, LPS challenge induces the transcription of gene encoding pro-inflammatory protein, which leads to cytokine release and synthesis of enzymes, such as cyclo-oxygenase-2 (COX-2). COX-2 usually can’t be found in normal tissues, but widely induced by pro-inflammatory stimuli, such as cytokines, endotoxins, and growth factors. COX-2 plays a vital role in the regulation of inflammatory process by modulating the production of prostaglandin E2 (PGE2). PGE2, induced by cytokines and other initiator, is an inflammatory mediator which is produced in the regulation of COX-2. Previous researches demonstrated that inhibition of COX-2 produced a dramatically anti-inflammatory effect with little gastrointestinal toxicity. Therefore, inhibition of COX-2 protein expression has far-reaching significance in the treatment of ALI. The effects of IF on LPS-induced mortality in ALI mice (n = 12/group). IF (5, 10, 15 mg/kg, i.p.) or DEX (5 mg/kg, i.p.) were given to mice 1 h prior to LPS challenge. The mortalities were observed at 0, 12, 24, 36, 48, 60, and 72 h. ###P = 0.001 when compared with the control group; *P = 0.05, **P = 0.01, and ***P = 0.001 when compared with the LPS group. Paraquot (PQ) is widely and commonly used as herbicide and has been reported to be hazardous as it causes lung injury. However, molecular mechanism underlying lung toxicity caused by PQ has not been elucidated. Curcumin, a known anti-inflammatory molecule derived from rhizomes of Curcuma longa has variety of pharmacological activities including free-radical scavenging properties but the protective effects of curcumin on PQ-induced acute lung injury (ALI) have not been studied. In this study, we aimed to study the effects of curcumin on ALI caused by PQ in male parke’s strain mice which were challenged acutely byPQ (50 mg/kg, i.p.) with or without curcumin an hour before (5 mg/kg, i.n.) PQ intoxication. Lung specimens and the bronchoalveolar lavage fluid (BALF) were isolated for pathological and biochemical analysis after 48 h of PQ exposure. Curcumin administration has significantly enhanced superoxide dismutase (SOD) and catalase activities. Lung wet/dry weight ratio, malondialdehyde (MDA) and lactate dehydrogenase (LDH) content, total cell number and myeloperoxidase (MPO) levels in BALF as well as neutrophil infiltration were attenuated by curcumin. Pathological studies also revealed that intranasal curcumin alleviate PQ-induced pulmonary damage and pro-inflammatory cytokine levels like tumor necrosis factor-α (TNF-α) and nitric oxide (NO). These results suggest that intranasal curcumin may directly target lungs and curcumin inhalers may prove to be effective in PQ-induced ALI treatment in near future. Wei-ting Zhong, Yi-chun Wu, Xian-xing Xie, Xuan Zhou, et al. Phillyrin (Phil) is one of the main chemical constituents of Forsythia suspensa (Thunb. ), which has shown to be an important traditional Chinese medicine. We tested the hypothesis that Phil modulates pulmonary inflammation in an ALI model induced by LPS. Male BALB/c mice were pretreated with or without Phil before respiratory administration with LPS, and pretreated with dexamethasone as a control. Cytokine release (TNF-α, IL-1β, and IL-6) and amounts of inflammatory cell in bronchoalveolar lavage fluid (BALF) were detected by ELISA and cell counting separately. 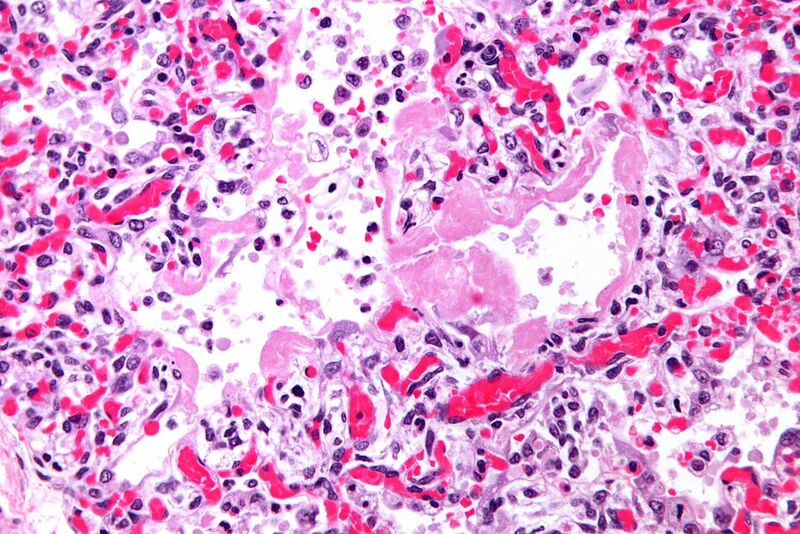 Pathologic changes, including neutrophil infiltration, interstitial edema, hemorrhage, hyaline membrane formation, necrosis, and congestion during acute lung injury in mice were evaluated via pathological section with HE staining. To further investigate the mechanism of Phil anti-inflammatory effects, activation of MAPK and NF-κB pathways was tested by western blot assay. Phil pretreatment significantly attenuated LPS-induced pulmonary histopathologic changes, alveolar hemorrhage, and neutrophil infiltration. The lung wet-to-dry weight ratios, as the index of pulmonary edema, were markedly decreased by Phil retreatment. In addition, Phil decreased the production of the proinflammatory cytokines including (TNF-α, IL-1β, and IL-6) and the concentration of myeloperoxidase (MPO) in lung tissues. Phil pretreatment also significantly suppressed LPS-induced activation of MAPK and NF-κB pathways in lung tissues. Taken together, the results suggest that Phil may have a protective effect on LPS-induced ALI, and it potentially contributes to the suppression of the activation of MAPK and NF-κB pathways. Phil may be a new preventive agent of ALI in the clinical setting. A mass of studies have been reported basically on alleviating LPS-induced acute lung injury in models. Phillyrin (Fig. 1), a lignin, is one of the main chemical constituents of Forsythia suspensa (Thunb. ), which is an important traditional Chinese medicine (“Lianqiao” in Chinese), and has long been used for gonorrhea, erysipelas, inflammation, pyrexia and ulcer. Previous studies indicated that Phil significantly inhibited NO production in LPS-activated macrophage cells. But there is not much evidence showing the anti-inflammatory properties of phillyrin. In the present study, we sought to investigate the effects of phillyrin on LPS-induced pulmonary inflammation in mice. Fig. not shown. A: Effects of Phil on histopathological changes in lung tissues in LPS-induced ALI mice. Mice were given an intragastric administration of Phil (10 and 20 mg/kg) or Dex (5 mg/kg) 1 h prior to an intranasal administration of LPS. Then mice were anesthetized and lung tissue samples were collected at 6 h after LPS challenge for histological evaluation. These representative histological changes of the lung were obtained from mice of different groups (hematoxylin and eosin staining, original magnification 200×, Scale bar: 50 μm). B: Effects of Phil on LPS-induced lung morphology. The slides were histopathologically evaluated using a semi-quantitative scoring method. Lung injury was graded from 0 (normal) to 4 (severe) in four categories: congestion, edema, interstitial inflammation and inflammatory cell infiltration. The total lung injury score was calculated by adding up the individual scores of each category. The values presented are the means ± S.E.M. (n = 4–6 in each group). ##P b 0.01 vs. the control group, **P b 0.01 vs. the LPS group. Cont: control group; LPS: LPS group; Phil + LPS: Phil + LPS group; Dex + LPS: Dex + LPS group. In summary, the present study indicated that Phil has a protective effect on LPS-induced acute lung injury. Phil significantly attenuated histopathological changes initiated by LPS via reducing over inflammatory responses. We also demonstrated that MAPK and NF-κB signaling pathways are the important targets of Phil to perform its actions. Phil acts by preventing NF-κB translocation to the nucleus or inhibiting the activation of MAPKs directly or indirectly, which is to be investigated in further studies. All these results suggest that Phil may be a new therapeutic agent for the prevention of inflammation during acute lung injury.